Marketing on the exterior of aircraft has never been so cost-effective or had such visual impact. Drive airline revenue from marketing materials on seat tray, overhead bins and other 'gray space'. Durable marketing messages are great for putting your customer's message across. We were proud to be contracted to make and fit the liveries for the first three Q400 aircraft for the startup airline. 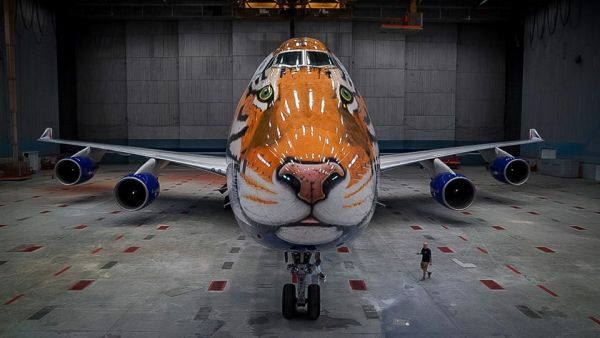 A unique and incredible project to highlight the plight of the endangered Siberian Tiger. Vietnamese carrier VietJetAir received the 9000th Airbus aircraft, and we were fortunate to be involved by creating the special livery. Celebration version of Air Corsica's livery to mark their 25th anniversary. We made and applied the Aer Lingus logo in large format to the belly of the A330 to be used in the Dublin FlightFest 2013. Further Seat Tray promo decals for our good friends at VietJet Air. We are proud to be a part of these exciting promotional campaigns. These simple but effective decals were made for the overhead bins of Norwegian's aircraft. This ad campaign was used on Australian international and internal flights. This eye-catching advertisement for a travel company was commissioned by an airline based in the holiday destination advertised. Smart Data Protection - Who's Looking? This seat tray decal brings home just how vulnerable data is on your computer. Distributed via the ad agency, this product appeared on several aircraft. Our talented colleagues David Nolan and Luke Bryant at work. See how one of our customers goes about designing, scheduling and implementing an aircraft marketing wrap. Announcing our new range of seat tray decals. Printed and cut exactly to your requirements. Call for more details. What are they? Well, they're like billboards, but on the overhead bins! Revenue generation from otherwise unused space.